Hockey Hall of Famer Teemu Selanne brings his A-Game to this elegant steakhouse and neighborhood tavern hybrid. 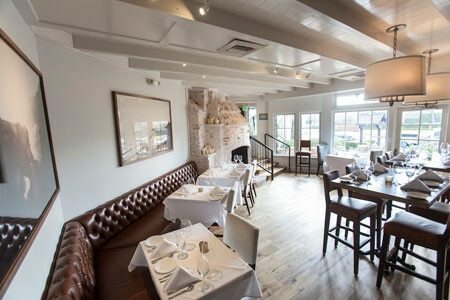 : Former Anaheim Ducks player and Hockey Hall of Famer Teemu Selanne does more than lend his name to this cross between an elegant steakhouse and bustling neighborhood hangout. He and his team transformed a historic Laguna Beach cottage into a stylish space that smartly ties into the town’s modern façades. The downstairs tavern is a sophisticated yet approachable place for locals to grab a craft cocktail, watch the game, and enjoy bites like the Wagyu beef tartare or the ground Kobe sirloin burger with truffle Parmesan fries. Lucky patrons may even spot the famous yet very hands-on owner. Head upstairs and you will encounter a chic setting replete with white linens, chandeliers and a cozy ambience. While Selanne’s name draws attention, the true stars here are found in the kitchen. Executive chef Joshua Severson, who worked under Tom Colicchio, displays an exceptional sense of composition with his dishes, one where simplicity prevails and every ingredient is delivered with a definitive purpose. His craftsmanship is evident in starters of Pacific diver scallops and the English pea soup with black truffle panna cotta. Severson’s skill turns steaks such as the truffle marrow butter-topped New York strip into edible art, and this deft touch is also seen in the apple wood-smoked salmon paired with pork belly. Accompaniments of Madeira wine-soaked mixed mushrooms and seasonal risotto demonstrate equal consideration to detail. Desserts follow Severson’s lead with whimsical, balanced options such as the apple cinnamon monkey bread finished with brandy toffee and served with rum raisin ice cream. The deep wine list has labels from appellations culled from all over the globe, and includes a special “Black List” that features rare, high-end selections.